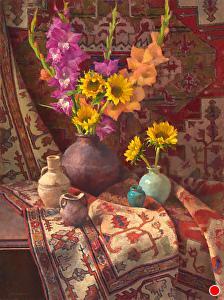 Jim McVicker has been a professional full time oil painter for 45 years. He and his wife Terry paint from life at home in the studio and outdoors on location. He learned by painting with his lifelong friends in Humboldt County. His painting style is true Impressionism. His process leaves the mark of searching and exploring each subject until his observations are complete. Every painting Jim finishes has the look of a well-loved work of Art. Students will have three days to to study and practice in the style of this truly legendary, and nationally renowned, California painter. This is a documentary film from 2008 about a true artist, the American painter Jim McVicker, who lives and works in the wild and woolly landscape of California's "Lost Coast:" The Pacific coast of Humboldt County, just south of the Oregon border. A largely roadless, sparsely populated zone of giant trees and salty little towns.